Mockorange Shrubs are an old fashion flowering shrub and a favorite for flowering hedges. Imagine the entrance of your home lined with a mock orange hedge of cascading, fragrant white flowers. Philadelphus virginalis shrubs are one of the most outstanding late spring to early summer flowering bushes. Of the many species of mock orange, this is by far the most popular, due in part to its very lovely fragrance and attractive white flowers. 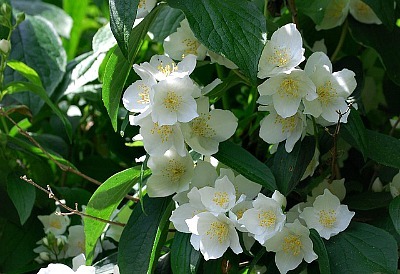 The Mock Orange Shrub's fresh bright green foliage is an attractive background for its pure white flowers. The stiff, yet graceful, branches and prolific flowers are excellent as indoor cut flowers. This shrub is a favorite in English Gardens, Victorian Gardens or Cottage Gardens. Mock orange has many uses in the landscape and this flowering hedge plant is especially enjoyable when grown near a walkway, border or driveway where one can enjoy its beauty and fragrance. For a gracious spectacle of green and white, plant about 3 to 5 feet apart. Please note: Fragrance from the common mock orange plants can vary. If you want to be certain that you are getting a mock orange with fragrance, order the Mock Orange Snowbelle to not be disappointed. One order means a collection of five plants. Yes, one order contains 5 of the mock orange plants.